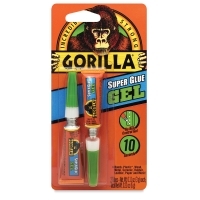 This is the only super glue tough enough to be called Gorilla. Its Impact-Tough Formula is made with rubber particles to form an impact-resistant bond that sets in 10–45 seconds, with no need for clamping. Gorilla Super Glue can be used on nearly anything, from wood to plastic, glass, metal, ceramics, and more. Finished projects dry fast, last long, and stand up to drops, bumps, and bangs. Super glue tubes have anti-clog tips with metal pins to keep nozzles clean. Super Glue — The thick formula offers improved application control. 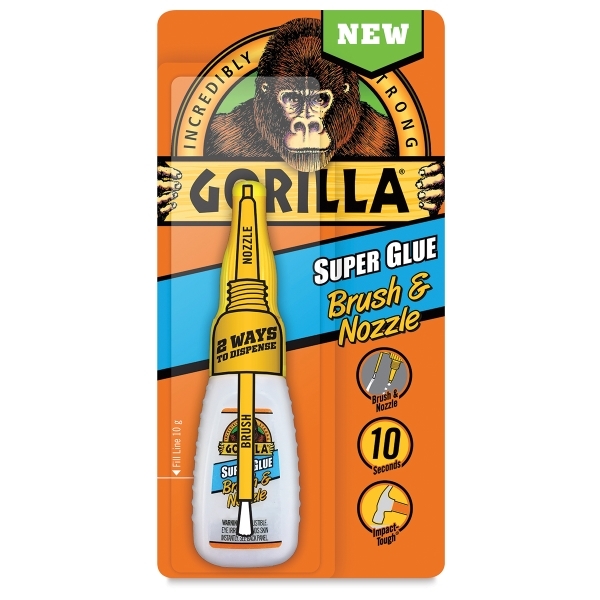 Super Glue Gel — This no-drip gel formula is especially great for vertical applications. 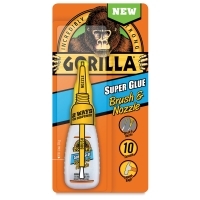 Super Glue Brush & Nozzle — Gorilla Super Glue Brush & Nozzle features a precision tip nozzle and a fine bristle brush for detailed projects requiring accuracy and control. The long-lasting, high-performance formula is easy to apply and dries quickly — in just 10–30 seconds. Its Impact Tough formula ensures your projects will stand up to wear and tear. Plus, a metal pin inside the bottle's cap will keep the nozzle from clogging. ® Gorilla is a registered trademark.™ For the Toughest Jobs on Planet Earth and Impact-Tough are trademarks.